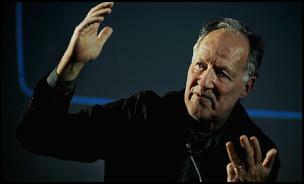 Werner Herzog has gained such a reputation for films and documentaries on overblown figures attempting to do big things (and invariably failing), that The Cave of Forgotten Dreams has already been dismissed by die-hard Herzog fans as being lesser Herzog, even though its critical reception has been almost entirely enthusiastic. Maybe the film’s embrace of 3D and/or Herzog’s recent appearance on The Simpsons led people to assume he was starting to relax a bit. Yet Herzog’s simple pleasure in showing the opposite of what his career has been built on – small people doing big things, despite not setting out to do so – and the sheer beauty of the 3D images, make The Cave of Forgotten Dreams a remarkable experience. 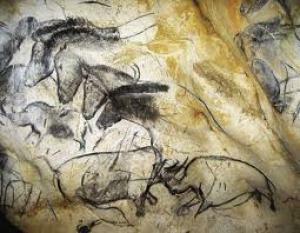 The Chauvet caves feature art from around 32,000 years ago. The caves themselves are shut off to the public, and Herzog managed to get a limited chance to film the art work. He decided to use 3D, a technique he had previously derided, in order to capture the contours and movement of the art itself. The images, almost so close that you feel like you can touch them, are so stunning, that you emerge from the film as if from a dream. The title has an obvious allusion to Plato’s allegory of the Cave – the idea that the shadows are the closest way to viewing reality, even if this reality is merely an illusion. And, as Herzog releases us from the cave, it is the light, the knowledge, and our overall understanding of this reality, which he is challenging. The art itself is spectacular. By using 3D, Herzog manages to show how the “primitive” artists used the contours of the rocks for spatial and aesthetic purposes, how metaphors and symbols were used (though for what, that’s anyone’s guess), and the intricacy of the lines and strokes. The film can easily be enjoyed simply as an exhibition. Yet the film is typically freewheeling – hung together by thematic concerns rather than any strict narrative build-up. 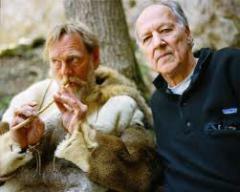 There are the typically eccentric figures that populate many of Herzog’s films, interview subjects who occasionally provide useful information on the caves and the paintings themselves, but who also have hints of the obsessive. There is also a cheery critique of those who valorise Picasso’s modernism (these paintings were doing it thousands of years before Picasso “invented” modern art). The film also features Herzog’s undeniable presence, and his constant philosophising. I for one have no qualms about hearing Herzog’s musings – perhaps it’s his deadpan German accent, or the fact that his seemingly throwaway comments re-contextualise the images (even if they take a bit of deciphering). In a typically Herzogian flourish, the film ends with an almost unbelievable coda featuring mutant albino crocodiles living in the run-off of a nuclear power plant (!). Throughout the film, Herzog struggled to determine what the art meant, the context of the paintings themselves, and the day-to-day realities of the artists themselves. The crocodiles may create a similar reaction in a few millennia’s time – judging by the audience reaction to it, the confusion exists today – just what will our descendants make of our behaviour? What will our legacy be? Herzog’s subjects throughout his career appear to lack a common thread, and he barely seems to discriminate in who might appeal as a subject – whether it is the Saharan mirages of Fata Morgana (perhaps a clear link to Cave of Forgotten Dreams), ski jumpers (The Great Ecstasy of Woodcarver Steiner) or the mysterious case of Kasper Hauser (The Enigma of Kasper Hauser) or failed Spanish conquistadores (Aguirre, Wrath of God). Herzog’s films have often looked at figures whose behaviour cannot be rationally explained; characteristics such as folly, madness, obsession, misplaced faith, and blindness (both literal and metaphorical) frequently abound. Frequently the images themselves are simply the end result of folly – the stunningly beautiful and disturbing images of burning oil fields in the aftermath of the first Gulf War in Lessons of Darkness. In that film, the landscape has a voice removed from humans, but inextricably tied to what humans have done to it. And, Herzog’s legendary travails match his interests – e.g. his notorious relationship with his frequent lead Klaus Kinski, or the strained circumstances in which his epic on Peruvian rubber, Fitzcarraldo, was shot. Herzog’s films have also looked at the fragility of language, whether it’s the subject of his 1971 documentary The Land of Silence and Darkness, Fini Straubinger, who was deaf and blind or the last man to leave a leper colony in Last Words, a lyre player who refuses to speak. Or, conversely, the baselessness of an overuse of language – such as the auctioneers in How Much Wood Would a Woodchuck Chuck. The smallness of humankind’s expressions however can leave lasting scars on the landscape, even if the individuals are easily ‘squashable’ or even if the individuals don’t quite fit in with society. His films have also been nomadically restless – unlike his ‘70s New German cinema contemporaries who had been read as trying to express then-contemporary (West) Germanic issues, Herzog’s films have touched every continent, and explored peoples from all sorts of different backgrounds right from the beginning of his filmic career (everywhere from Alaska to Antarctica) – an almost universal conception of humankind, beyond what, to Herzog’s mind, are the silly conceptions of ideology and nationalism. This has led to the occasional criticism of Herzog of aesthetics trumping politics, most notably in films like Lessons of Darkness and Ballad of the Little Soldier. Herzog’s individuals try to stake their puny claims against something much, much bigger – nature, space, history, and in his films invariably fail. He is even willing to acknowledge when he himself comes up short – e.g. like his inability to discover what really drove Timothy Treadwell in Grizzly Man. But in Cave of Forgotten Dreams, far more so than in his previous characters, the ecstasy for both Herzog and the audience comes from the fact that these individuals, unknown and forgotten in an historical sense, have managed to do something so simple, but something so spectacular – they simply communicated, and as a result, they left a thing of beauty behind.